Thinking about: Baby proofing! The boy's a fast crawler now and is CONSTANTLY pulling himself up on EVERYTHING! We got some baby gates to keep him in one spot when Nana needs a bathroom break during the week when she is babysitting, or when Mama needs to put in a load of laundry, etc. We don't necessarily want him to be stuck inside the gates all the time, but our house just isn't ready for the tornado he has become! We'll have to keep working on it in the coming days/weeks. For now we have 2 gates hooked together making a little area for him in the living room. Not a good permanent solution, though. Reading: The Outlander series, for the 3rd time. With the show in production & the next book coming out later this year, I figured I might as well refresh my mind. Listening to: all kinds of music on the iPod playing over the surround sound in the living room. It's nice to have it on as background music as we are doing laundry, some gardening, and other house chores on this lovely Sunday. 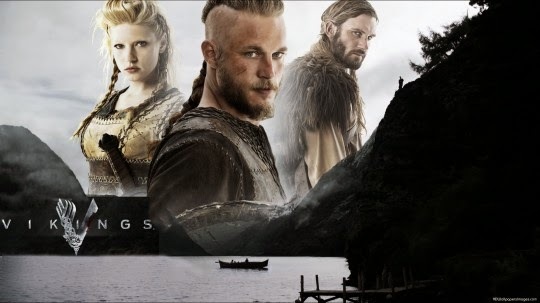 Watching: Nothing today but we've been watching the first season of Vikings that we have had saved on the DVR. The second season just started up and we've enjoyed the show so far. Also looking forward to watching the next episode of Amazing Race! Thankful for: Our new lives. Everything is so different now with our baby, and there are some days it seems crazy/busy/tiring... but we wouldn't change it for the world! He's made us both better people. We may have imagined, but never really knew how much we could really love our little man! He's the light of our lives. Linking up today with A Mama Collective! I am so not ready for the day Elsie decides to become super mobile. He's super cute. But I remember the tornado days. Sigh. It's not just safe for your home, it's safe for him. Check out onestepahead.com they have a big octagonal gated area... You can unhook and make it go straight across a room or you can keep him in the middle. Ah baby proofing, thankfully no kiddos here yet but we've had to "Dane-proof" with our big puppy and I'm pretty sure I've had to go about it in the same way! We might even have to get those outlet covers because he licked a socket...silly dog. We used one of those super yard playpens when he was a little guy, but even as a puppy I felt bad for him being confined to one area, so I can imagine that it's harder with a little human. Good luck on the baby proofing!